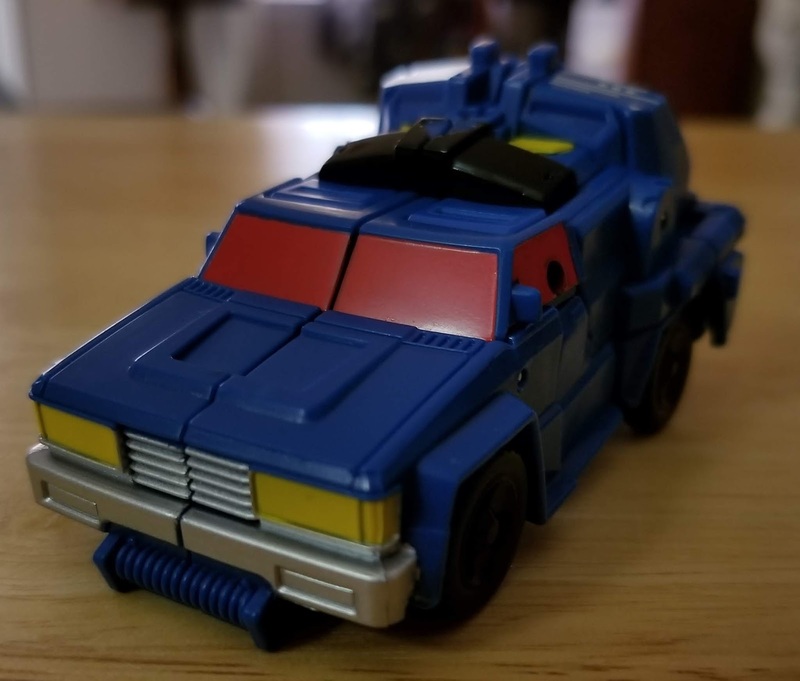 Somebody at Hasbro had a great idea, taking the classic Duocon Battletrap and turning his two vehicle forms into separate characters. That's what we got here with Roadtrap, now the SUV portion of the robot is his own character as well part of the combiner. The end result is pretty neat, with Roadtrap (now his own bot) making for a pretty decent little toy. He's short and squat, owing to the fact that his third form is a pair of legs. Often with combiners you have to sacrifice a little for the combined form and that's true here as well. 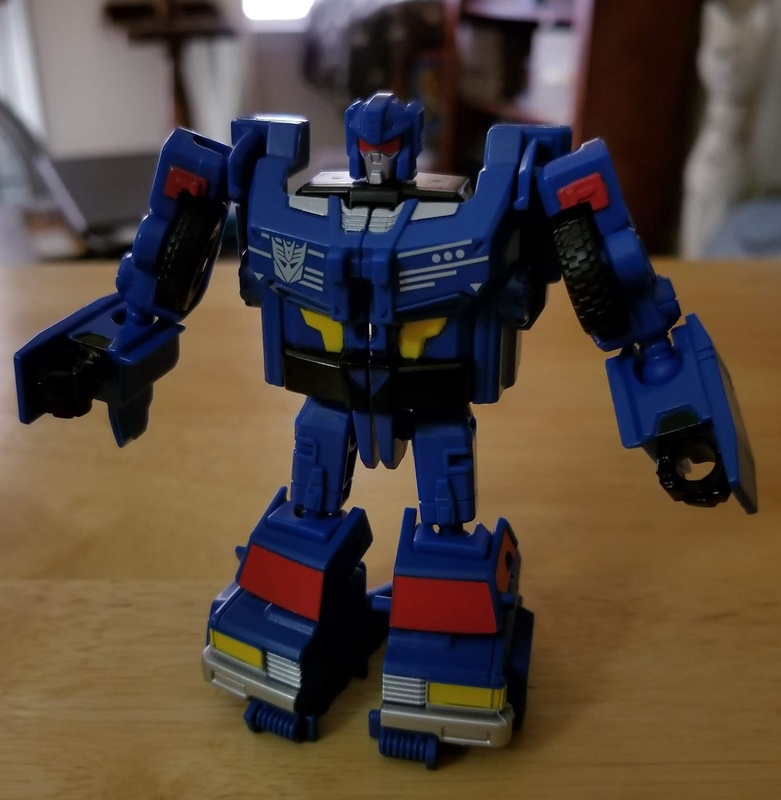 Fortunately, it's not too bad and Roadtrap's still a pretty satisfactory little figure. I'm really impressed with the articulation, which owes more to his various modes and the means to put the toy into them than anything. Which equals a pretty articulated little guy. However, it that means to transform between the forms leads to my only real problem with the figure. I don't like transforming him. 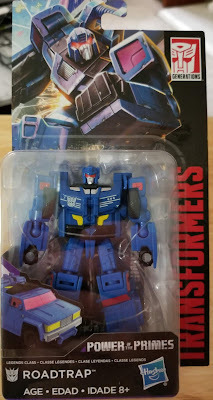 While at first glance, he doesn't seem to challenging, but to go from robot to truck, there's a bit of magic with his chest that must be done that I didn't enjoy doing. It wasn't terrible or anything, just a little more fiddly than I'd like for a smaller figure. This partially owes to the fact that he also turns into a pair of legs (more on that later this week), but it still hampers the fun of the stand alone toy. Either way, I quite like the little guy despite a little trivial inconvenience. It's nice to see a little original thought go into a update of a classic character and add to him a bit.